Arrowhead are remaking Gauntlet, from the ‘80s. Had you forgotten? In that case you probably won’t particularly mind that it’s been delayed by a few weeks. The developers will spend the next month “fine-tuning details” to ensure they’ve got a “robust multiplayer experience” on their hands. And then come September 23, we’ll be playing a sort of artfully-stunted action RPG. 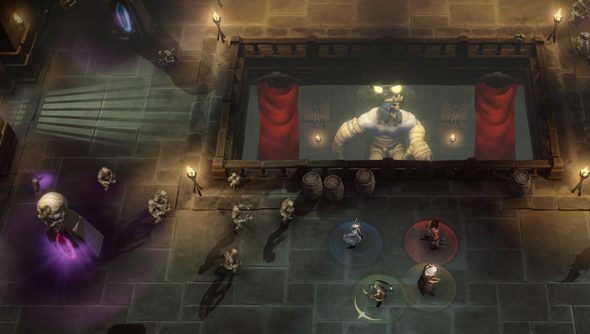 Gauntlet is to be published by Warner Brothers’ digital Games Vault label on Steam. Next year, it’ll be adapted for Valve’s living room OS and Steam Machines. By way of apology for the delay, Arrowhead will give players who’ve pre-ordered the game an in-game item – a wizard’s robe made from the dead imp-children of the greater demon, Kerthull. Uh, thanks. The entire development of the action RPG genre has happened since Gauntlet and 1985 – but Arrowhead promise this will be a “completely modernised” game that takes all that into account. That said, nu-Gauntlet clearly revels in its arcade simplicity – offering a trad fantasy premise but no plot, and the opportunity to snaffle roast turkeys for health. Co-op players pick from four characters: the Wizard, Warrior, Valkyrie and Elf. They’re each distinguished by contrasting abilities, though the mage seems to get away with the bulk of the most entertaining ones. Nu-Gauntlet definitely has its own flavour, and it’s probably turkey. The game encourages unhealthy competition – there’s no automated loot-splitting here. And there’s a whiff of Spelunky about the procedurally-generated levels in which Death himself chases you through the gauntlet. You interested?